Sweet hills and Tuscan country life. 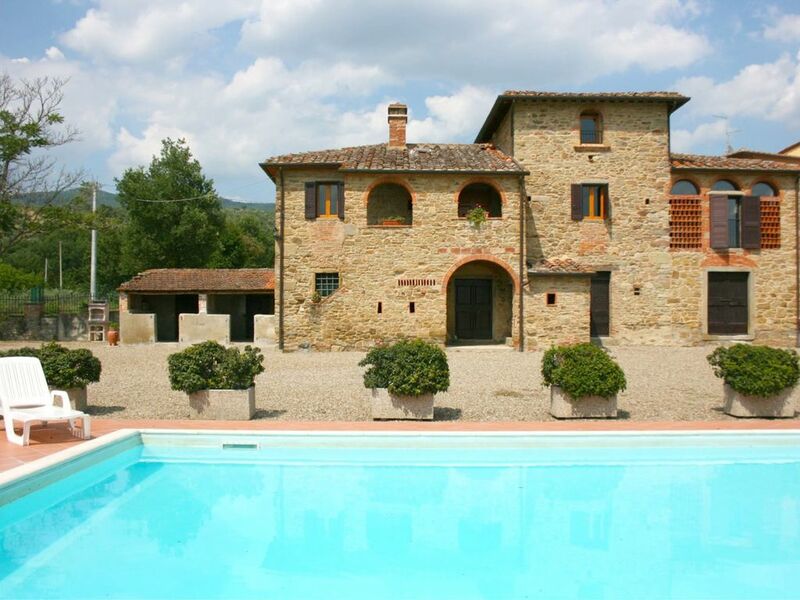 Old farmhouse with the typical Tuscan architectural traits, placed at the foot of high hills in the sweet and fertile Valdichiana Valley. 3 kilometers away is the lovely village of Castiglion Fiorentino, with its narrow streets, old churches and ancient residences, endowed with all services and ideal to spend lovely evenings of country life. A few steps from the house, within walking distance, there is a nice restaurant where to enjoy typical local dishes. The city of Arezzo, with its famous monuments and works of art, is just 15 km away. Tradition, the peasant rustic style. The farmhouse renovation has maintained the traditional construction features, turning the house into a cozy Agriturismo that mostly keeps intact the original rustic features of the Tuscan countryside, even combining them with some modern amenities such as Wi-Fi connection. In front of the house the completely fenced swimming pool (size. 6 x 12 m., depth m.1,50- 2.50) and a large outdoor area with gazebo, garden furniture, barbecue, children playground and tennis table, where to spend summer days in complete relaxation. The garden is completely fenced, ideal also for pets. FIRST FLOOR: Entrance by an external stone staircase and loggia. Sitting/dining room and kitchenette, double bedroom, bedroom with bunk beds, sitting room with double sofa bed (only for children up to 12 years), two bathrooms with bathtub. An easy wooden staircase goes up to a tower where there are two single beds. EQUIPMENT: oven, microwave, dishwasher, filter coffee maker, toaster, fans, mosquito nets, Wi-Fi Internet access. Très bon séjour. La maison est fidèle au descriptif. Très belle piscine. L'accueil est chaleureux. Elle serait parfaite avec un lave-linge et un lave vaisselle. Very nice stay. The house is faithful to the description. Very nice pool. The welcome is warm. It would be perfect to find a washing machine and a dishwasher available. Very nice house with a great pool. Several supermarkets close by as well as many charming italian towns and wineries.